A neon sign shines above the entrance of the Hotel Inglaterra in Havana, Cuba, Feb. 13, 2018. After dusk in Havana, an ice-blue neon sign illuminates the faded facade of the Cine El Megano, one of many abandoned movie houses in the Cuban capital, lighting up a once vibrant corner at the heart of the Caribbean city that had gone pitch black in recent decades. The glowing neon italic letters fill the building's colonial facade with an art deco accent between the doors below and the wraparound balcony above. It is the work of Cuban artist Kadir Lopez Nieves, who is restoring the vintage signs of the cinemas, hotels and cabarets that lit up Havana's nightlife in its 1950s heyday. His project, dubbed "Habana Light Neon + Signs," has so far restored around 50 signs, reflecting a broader revival in Havana. The city, one of the architectural jewels of Latin America, has been enjoying a tourism boom. "They called it the Broadway or Paris of the Caribbean because it had so much light and brilliance," said Lopez Nieves, during an interview in his workshop and gallery. "But when I started out the project ... Havana was switched off in terms of light." Cuban artist Kadir Lopez Nieves, who is restoring the vintage neon signs of the city, works in his workshop and gallery, in Havana, Cuba, Feb. 19, 2018. After Fidel Castro's 1959 leftist revolution, many of Havana's ritzy entertainment venues, often run by American mobsters and frequented by the rich and famous, were shuttered or slowly became run-down. 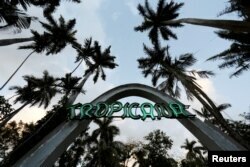 Over the decades, tropical weather wrought havoc on their neon signs. The communist-run island, laboring under a U.S. embargo, often lacked the funds and know-how to fix them. As elsewhere, other forms of lighting, such as LEDs, proved cheaper and the ornate neon signs were abandoned. 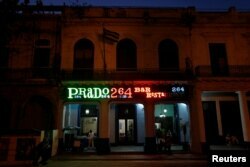 A neon sign shines above the entrance of the restaurant Prado 264, in Havana, Cuba, Feb. 15, 2018. Lopez Nieves set about restoring the neon lights of a dozen cinemas as a project for the Havana Biennial arts festival in 2015. His work delighted locals. "It's lending more life to the city at night," said Alberto Echavarria, 68, guarding a parking area down the road from the Cine Megano. He said the sign recalled the once "fabulous" ambiance of the neighborhood, which lies close to Havana's neo-classical Capitol Building. Shining incandescent from afar, the sign also helped to make the run-down area more salubrious by chasing away shady characters, he said. "Obscure zones would go from being marginal to being photographed," said Lopez Nieves, who then started restoring other neon signs, using historic documents such as old photographs for guidance. "A personal project turned into a social project." The initiative has become self-financing, thanks to the ale of new commercial signs to Cuba's fledgling private sector, costing between $200 and $3,000. Close to Havana's seafront, the Bar Cabana sign flashes red, while around the corner the La Farmacia restaurant sign burns white. A neon sign shines over the entrance to the cabaret Tropicana in Havana, Cuba, Feb. 20, 2018. Lopez Nieves says he has a large contract to restore the lights at Havana's famed Tropicana nightclub, which in its prime boasted famous patrons such as Hollywood stars Frank Sinatra and Humphrey Bogart. Amid a global neon revival, the initiative started attracting enthusiasts from all over the world, who offered their expertise, he said. "I love [neon] because it's an organic light that lives and breathes. And then to discover an entire city — it's almost like finding a treasure box," Jeff Friedman, who runs a New York neon sign manufacturing company, said during a trip to Havana. Foreign expertise has come in handy, Lopez Nieves said. There are only a few craftsmen left in Cuba who know how to bend the neon tubes into letters and fill them with gas to create different colors. Lopez Nieves hopes to safeguard that knowledge with his next project: the creation of a neon center in the abandoned art deco cinema Cine Rex. It would host a museum and workshops, as well as a store for new and classic designs. He plans to open it in December. "Neon is having an important revival," he said, "and I'm glad we're part of that."